So today I'm excited to continue on with the tour of our holiday home! In case you were snoozing last week (*yawn* which I don't blame you! This time of year is exhausting!) 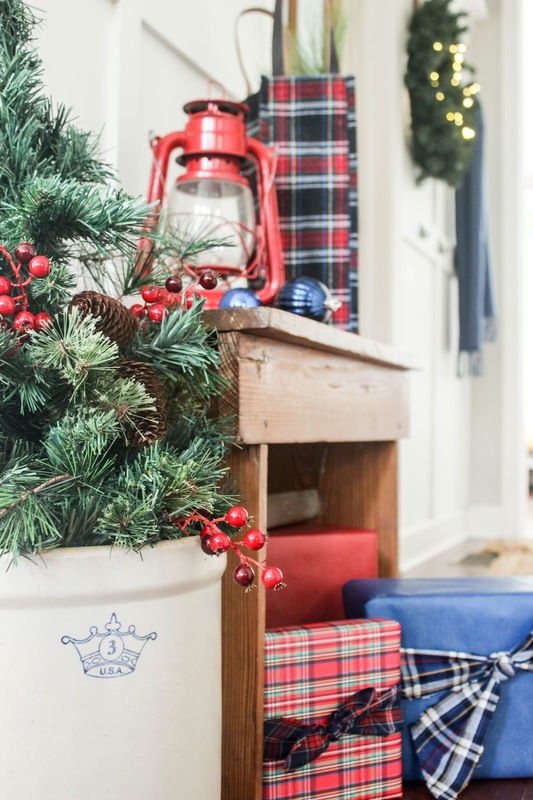 I invited everyone in for our first Christmas tour of the season, which happen to include our entryway and dining room all decked out in my blue and red holiday color scheme. It was a risky choice of colors to go with and boy did I sweat bullets when I went to hit "publish" on that tour, but based on the feedback I've been receiving here and on Facebook and Instagram, you guys seem to really like it! Phew. I personally love that it's traditional with a non-traditional twist. If that makes any sense? Today I'll be sharing a handful of spaces, including one of our Christmas trees (at last count, I think we had 4, but 2 are smaller so those don't even count in my book😉), so let's get to it! I only share a little peek into this room because it's a space we haven't really worked on since moving in (Ha! Which was 4 .5 years ago!) You'll see we still don't even have curtains in here! 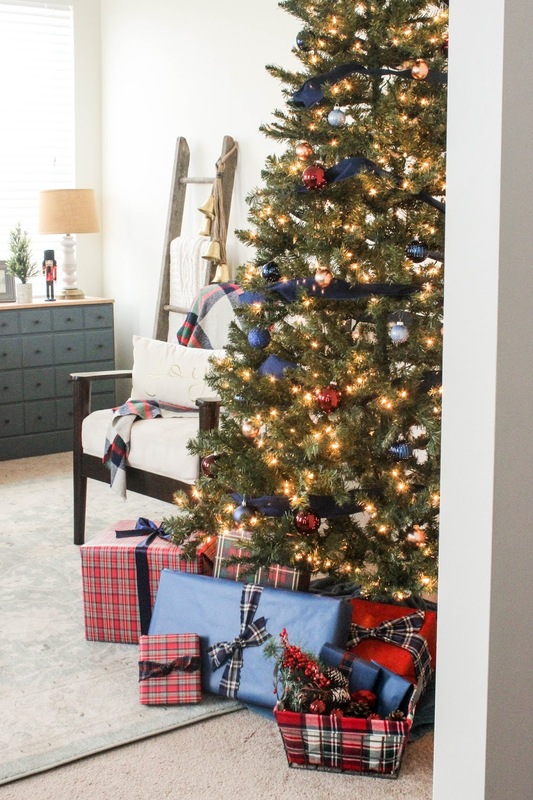 In the mean time, I love to add what I refer to as "Mommy's Decorator Tree" in here so it looks somewhat festive and cozy for the holidays. 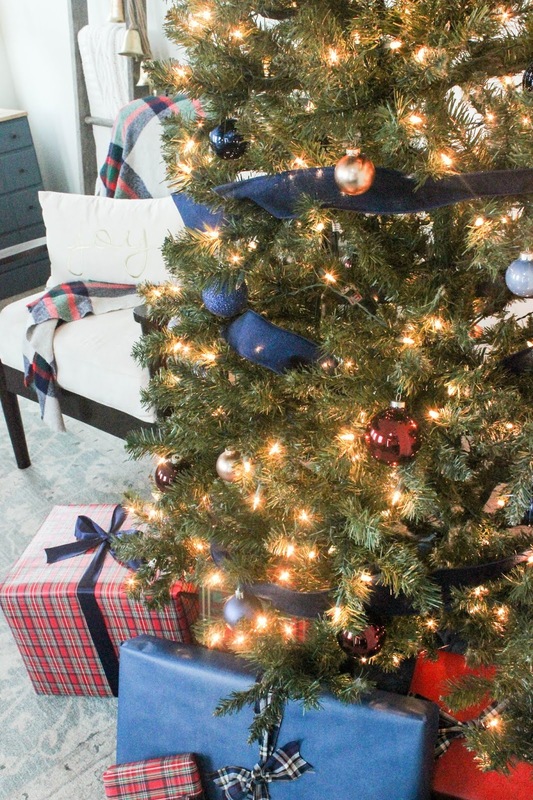 We have a nice twelve-footer in the family room that we use as our main tree and to open gifts around, and this tree gets to be ALL mine to play with. It's the tree the hubby and I bought when we were first-time home owners, and it's definitely seen better days but it works for now. 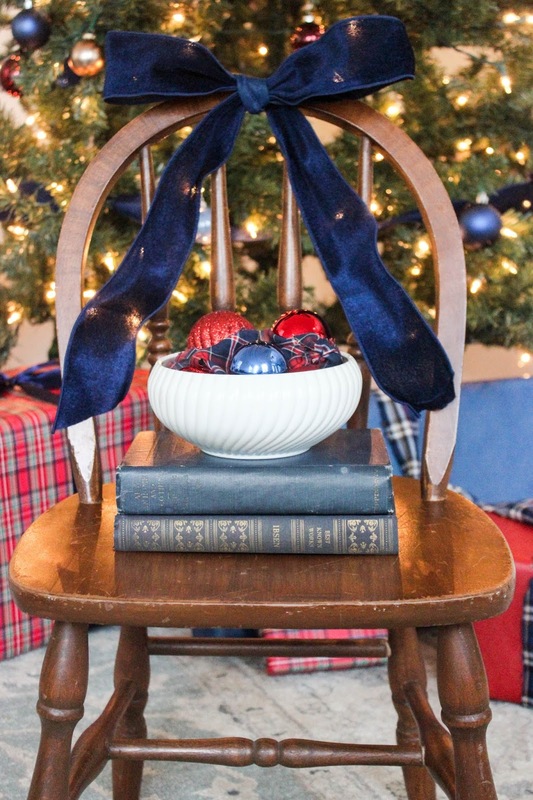 I kept it rather simple with a few strands of blue velvet ribbon from Michaels and array of blue, red, and gold ornaments. I have to say my favorite thing about this color palette, is the rich tones against the dark greenery! And can you guess what the "ribbon" on the packages are? Yep, more torn up thrift store plaid shirts! Some of you may remember from last week's tour how I shared this budget-friendly tip! 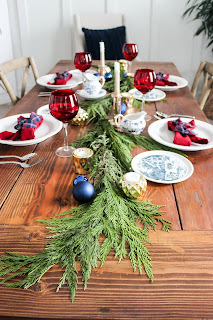 You can revisit last week's post to see how I used them as a tree skirt and napkin decor. For $4 and 3 shirts I've really gotten a lot of use out of them among our Christmas decor. My Aunt from Wisconsin came to visit not too long ago, and I got to take her to a few of my favorite antique stores (she has a love for decorating too!) The plaid throw was a result of that adventure. I was so excited that it included all of the colors I was looking for. The white and gold "joy" pillow and bells were a purchase from last year and help break up some of the darker colors. Some of you may have heard me mention a time or two about how vintage children's chairs just seem to appear in my trunk any time I come back from an antique or thrift store. It's a really strange phenomenon, huh? I went with the NOEL on our top shelf in the kitchen eat-in area again because I really liked how it looked last year. I know as bloggers we feel the pressure to come up with all new ideas every year but sometimes if ain't broke than don't fix it. Plus, I find it challenging to decorate shelves so this was my lazy way out! Wink, wink. 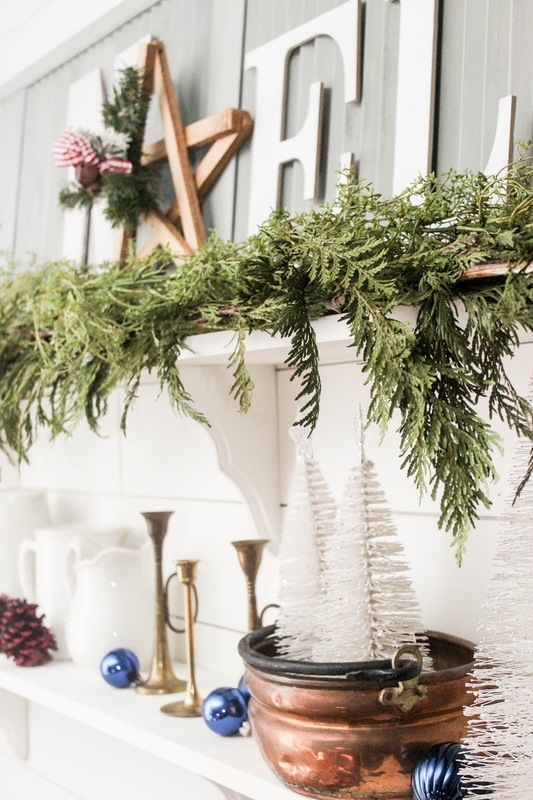 I did, however, add a strand of faux and real garland to dress it up a bit. It kind of reminds of messy bead head. Haha. Yes, messy bed head garland should be a new thing! For the bottom shelf, I kept our white pitchers and just added a few touches of copper and brass to warm it up a bit. I found the trumpet candlestick holders at the thrift store and thought they were really sweet. 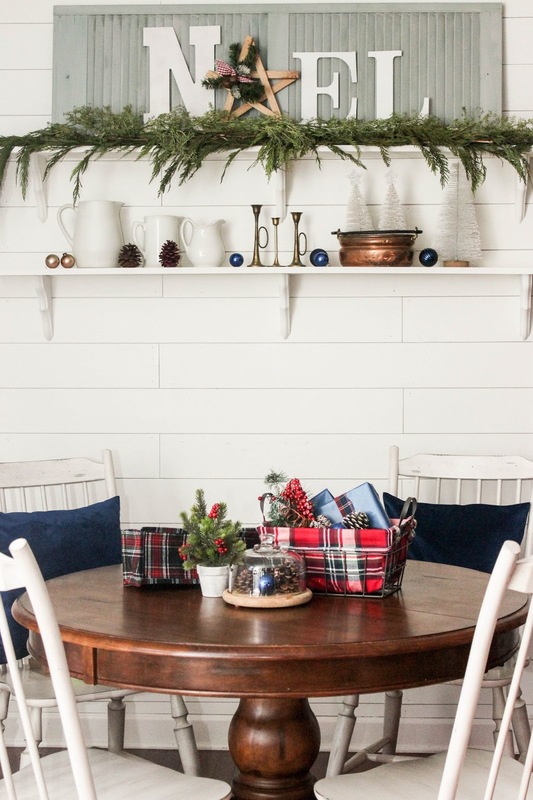 The colored ornaments and the painted pine cones helped tie in the color palette I've used through out our home this season. As far as the tabletop, a festive arrangement of well, random stuff. 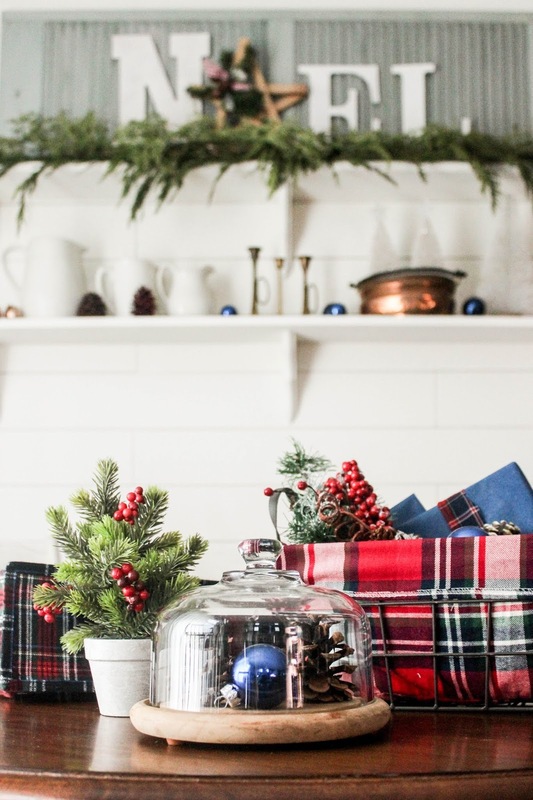 As you can see I really like that plaid wired basket and the little glass cloche is the perfect place for a gathering of more ornaments and pine cones. I bought the navy velvet pillow covers a few weeks ago and have to say I was super impressed with the quality of them! I'll probably be buying some other colors for other seasons. Plus, you can't beat that price! 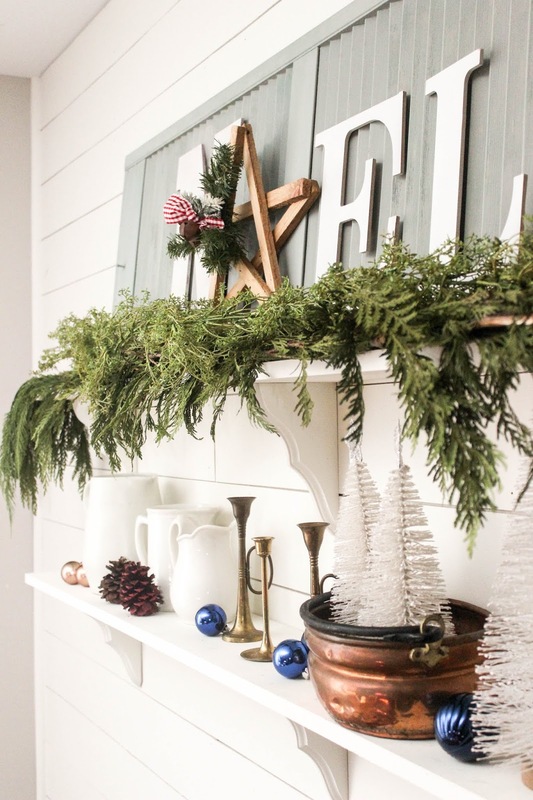 And of course, what's Christmas without decking the halls? 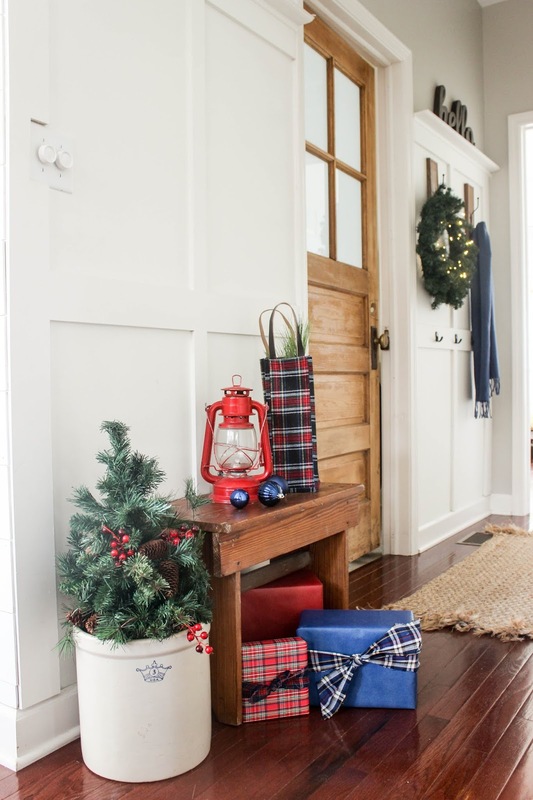 I love to see a little touch of the holiday season any time we enter or leave our home. Gives my insides all the warm, cozy feels. 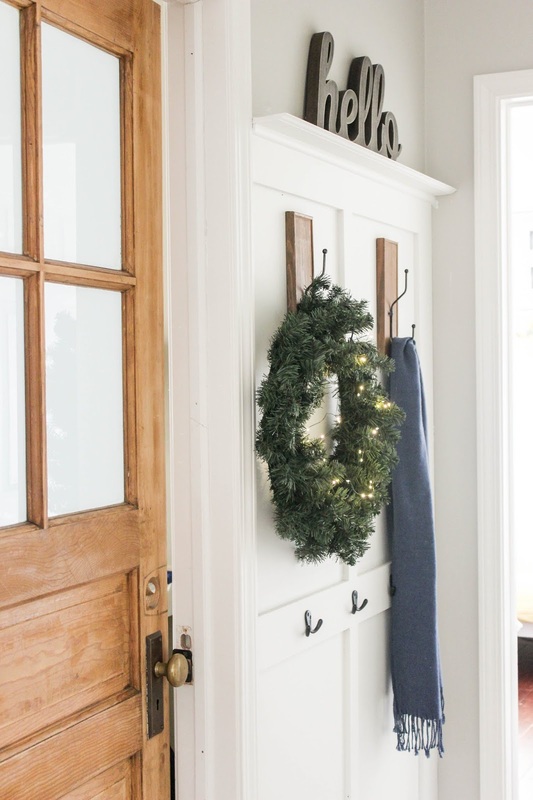 A simple, plain wreath embellished with a strand of twinkle lights helps make this little space glow with Christmas joy. Can you believe this is my first time decorating with twinkle lights?! I'm obsessed with them and don't know what I've been waiting for! 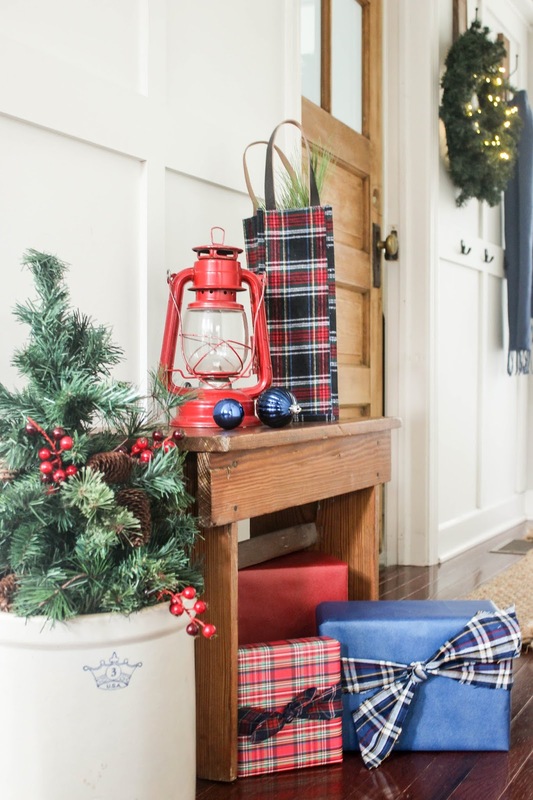 Wrapped packages and a vintage oil lantern (that I borrowed from the kids' camp-themed playroom) nestled around the little old bench helps create a festive Christmas scene. You want to know a secret? Those packages are empty boxes and my kiddo's puzzles. 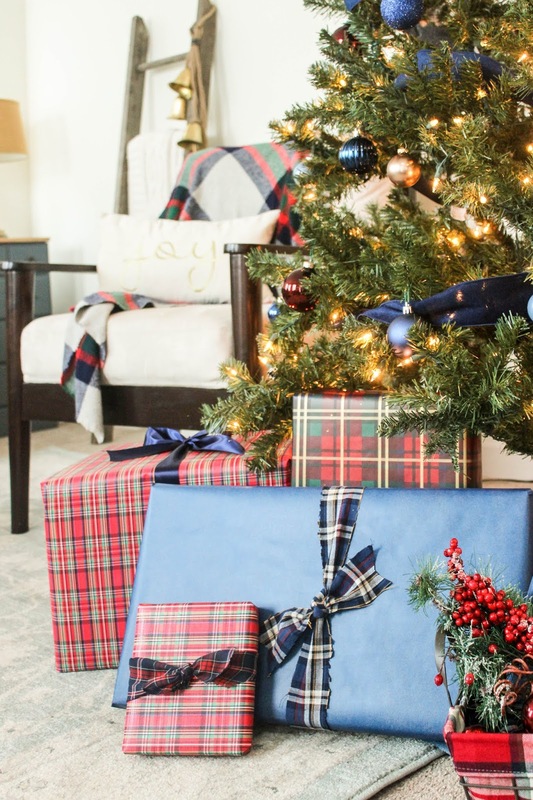 Never underestimate the beauty of a faux present, folks! Now I just have to remember to not mix them up with the real presents! So before we wrap up this year's holiday tour, why don't we take a quick visit upstairs to Little B's room! Some of you may recall when I decorated the playroom a few years ago here and here for Christmas. 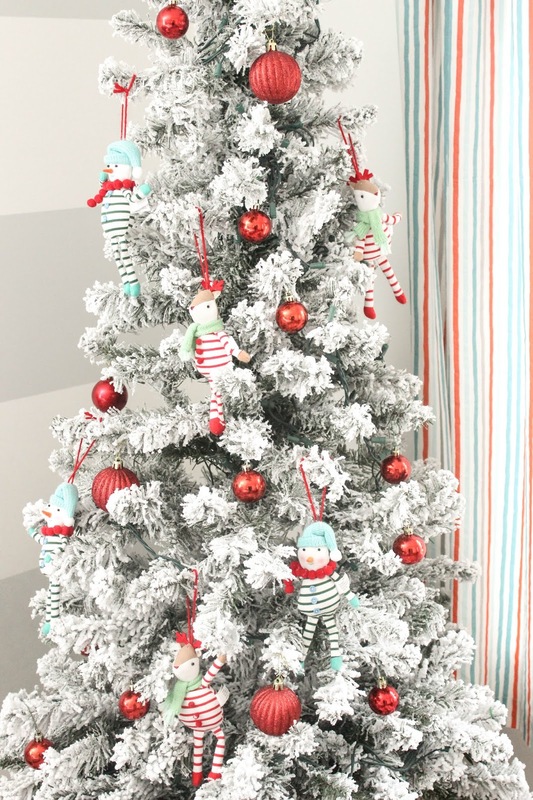 Little B has been asking almost everyday when he comes home from school if I've put the tree up in there yet? Somehow he remembers this from when he was 3! Honestly, I did not have the motivation to clean out that room (ugh...so many toys!) AND decorate it, so I comprised and surprised him one day by decorating his bedroom. It was a lot of fun and he was really excited when he saw it! 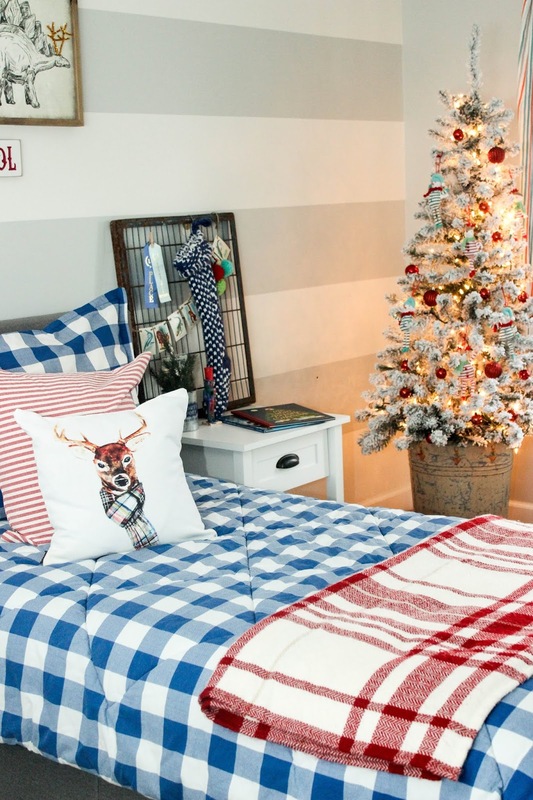 His blue gingham comforter with a few touches of festive red made it really easy for me to carry on my holiday color palette. 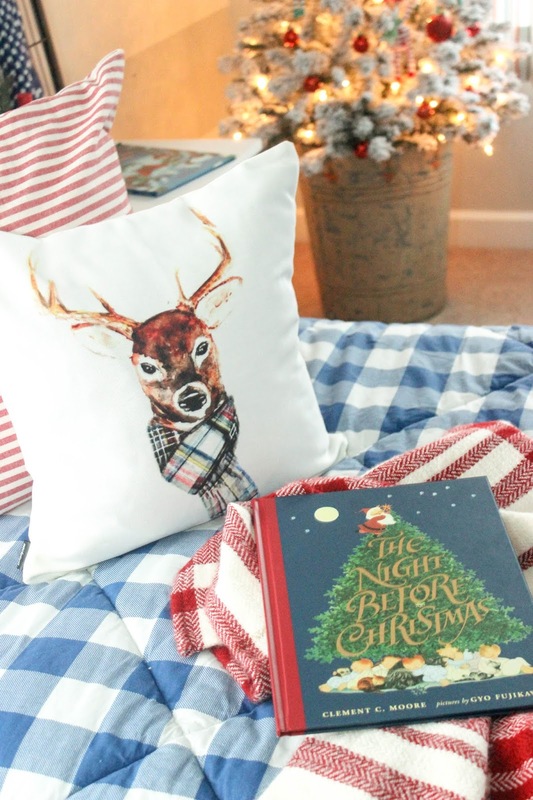 The throw we had and the deer pillow cover is one of Lucy's from Craftberry Bush's creations. I picked it up a few years ago from Society 6. 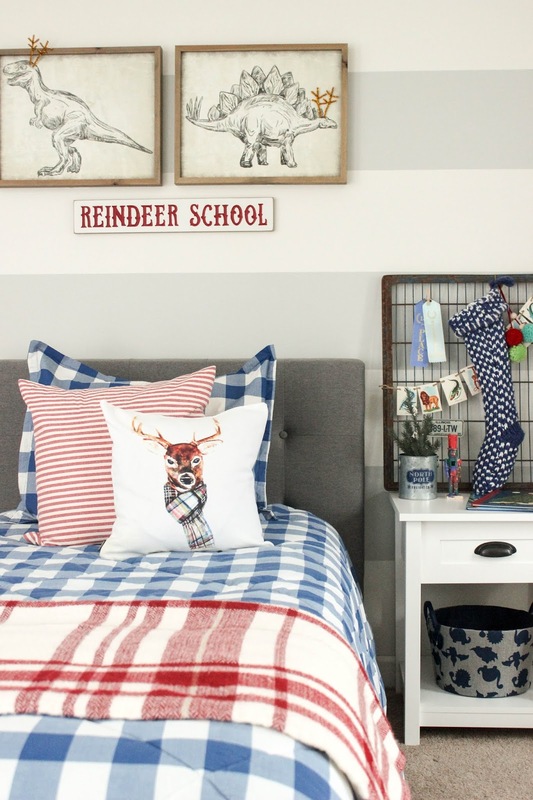 The second I spotted this "Reindeer School" sign I just knew I had to have it for his room! 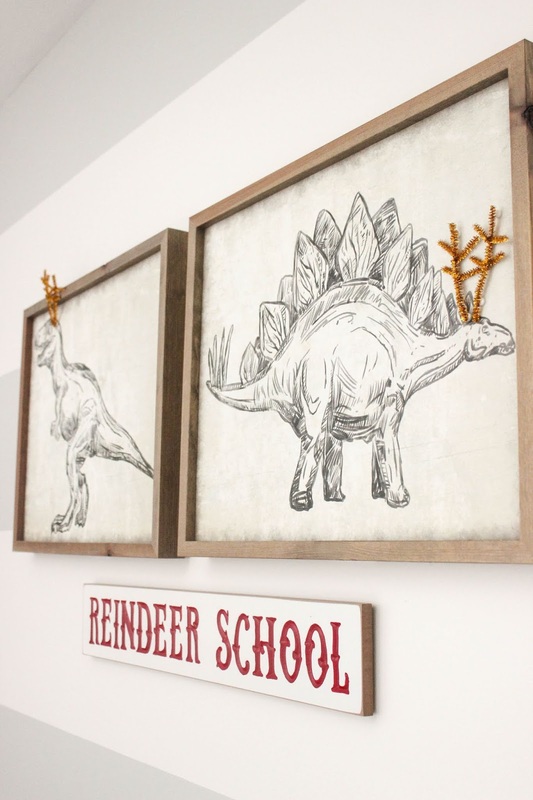 Of course his dinosaurs couldn't show up to school with out their own set of antlers (that I made out of gold pipe cleaners). Little B really got a kick out of those. 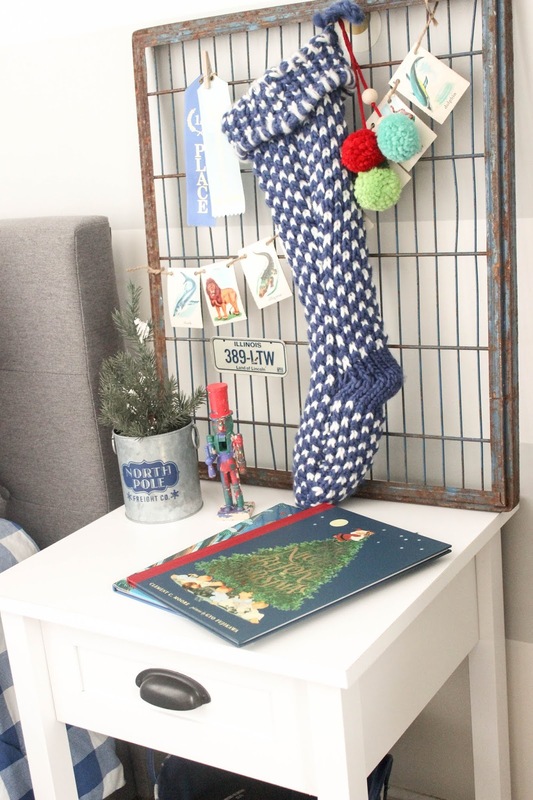 A colorful stocking and my favorite little North Pole pail that I bought last year adorn his bedside table. The nutcracker he painted last year and I've always loved that it has this abstract feel to it. The flocked Christmas tree that use to call the corner of our dining room home made it's way up here. Now that we have a corner cabinet in the dining room, there's no room for a tree. I found these adorable pinstripe reindeer and snowman ornaments at Target. The red ornaments we grabbed from our stash. 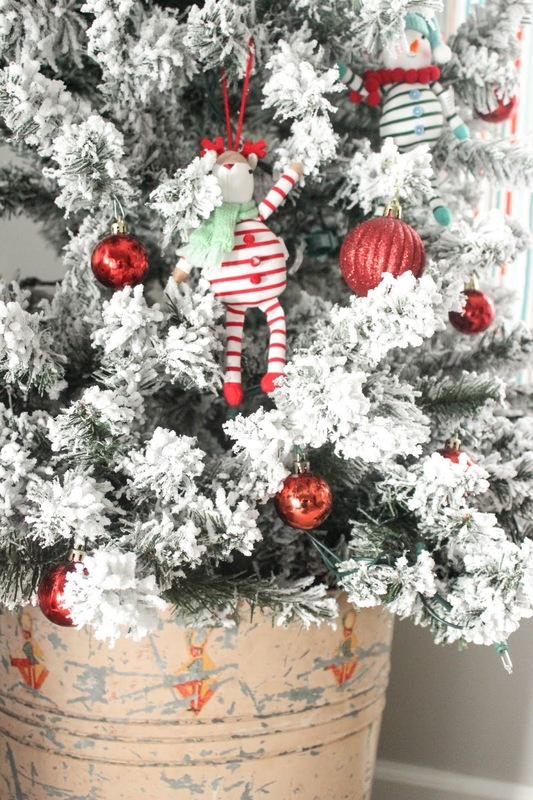 The vintage tree bucket is probably one of my all-time favorite Christmas purchases ever (I know I say that a lot!) It's kind of hard to tell but it has little, worn toy soldiers circling the top of it. Is that not the sweetest?! I have this thing for beautifully illustrated childrens' books and absolutely adore this version of "The Night Before Christmas". I found it on Amazon last year and can't seem to find it there anymore, but if you're looking for a version of this book and find it, I highly recommend it. 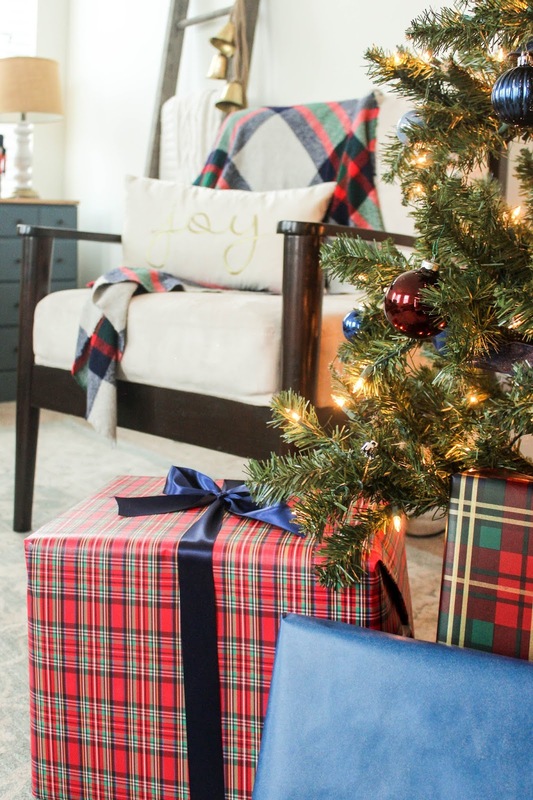 And that's a wrap on this year's holiday home tour! I hope you enjoyed your visit and perhaps found a little inspiration for your own home. Thank you so much for stopping by this little ol' spot of mine. Wishing you and yours a safe and joyful holiday season! Visit last week's holiday tour here. 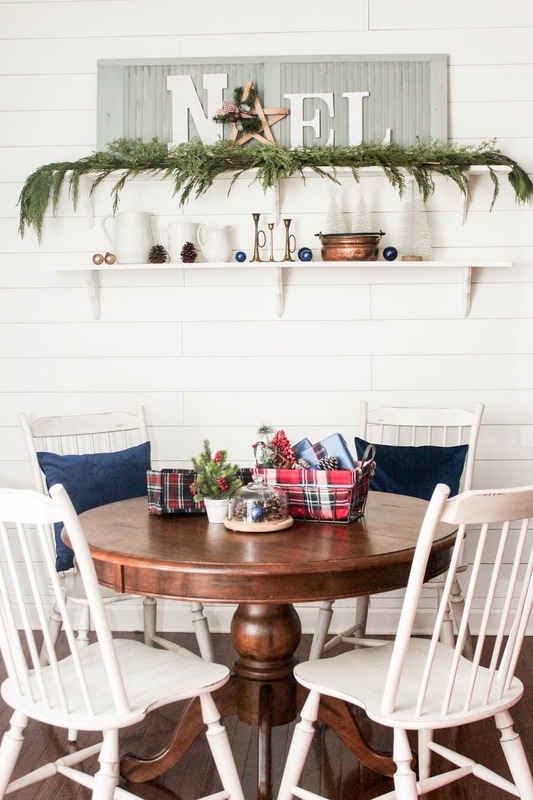 See how we decorated last year! I have really enjoyed your post. For some reason it has really captured my fancy. I am 62 with grown children and almost grown grandchildren. I want to decorate by hubby says since we're alone there is no need. So I'm living my decorations through my friends on the net. Thank you for the simple beauty.